Figure 4.1: Two-dimensional plot of the spectrum of a blackbody with different temperatures. Reminder: the color of the curve on the plot is not intended to be indicative of the color of the object emitting that light. If you study this plot, or one of the interactive blackbody radiation demonstrators we used in the last lesson, you can prove to yourself that the color of a star provides a fairly accurate measurement of its surface temperature. For example, a 4500 K blackbody peaks in the red part of the spectrum, a 6000 K blackbody in the green part of the spectrum, and a 7500 K blackbody in the blue part of the spectrum. Measuring a star’s spectrum is not always easy, but astronomers can often measure a star’s color reasonably easily. To do this, they put a blue filter (B) on the telescope and observe the star. They then re-observe the same star with a visual (V), or yellow, filter. The B filter measures the star’s brightness in blue light, and the V filter measures the star’s brightness in yellow light. The difference between these two, B-V, is the star’s color. The animation below shows a plot of Frequency vs. Intensity, There is a yellow band showing the frequency range that corresponds to the V filter, and a blue band that illustrates the frequency range for the B filter. When you click the play button, you see an animated curve representing blackbodies of different temperatures, and it marks the B and V measurements through these two filters for the different blackbodies. Note how for the three different objects with three different temperatures, that for the coolest object: its B intensity is smaller than its V intensity, for the warmer object: they are roughly the same, and for the hottest object: its B intensity is larger than its V intensity. In this animation, frequency of light is plotted on the x-axis (which, you should recall is related to wavelength and color of the light) while intensity of the light is plotted on the y-axis. When you click play, it shows the blackbody curve for a 3,000K object. Note the relative intensity of blue light (in the B band) is less than the visual, or yellow-green light (in the V band) for this object. It then shows a curve for a 10,000K object and how the relative intensities change for this hotter object to become nearly equal. Lastly, it shows the curve for a 30,000K blackbody which emits significantly more B-band light than V-band. In addition, look at this image: Hubble Space Telescope image of star cluster 47 Tucanae . Astronomers took images through different colored filters (in this case, near-infrared, I, visual, V, and ultraviolet, U), and added the three images together to produce a close approximation of the colors we would see of these stars with our own eyes. You can tell that many of the stars are similar in color; however some stand out as being much redder than the others. These red stars have the coolest temperatures among the stars in the cluster. Another good example is this color image of Albireo  taken by students at the University of California, Berkeley. They adopted the double star system Albireo as the “Cal Star,” because the two stars (one blue and one yellow) match the school’s colors. Once again, we know from the colors of these stars that the blue star is hotter than the yellow star, because its apparent color indicates that the peak of its emission is in the blue, while the other star’s peak is in the yellow part of the spectrum. At Hubblesite, they have an extended tutorial on the "Meaning of Color in Hubble Images. " which includes a discussion of the filters used by astronomers  to determine the color of astronomical objects. Recall from Lesson 3 that the spectrum of a star is not a true blackbody spectrum because of the presence of absorption lines. The absorption lines visible in the spectra of different stars are different, and we can classify stars into different groups based on the appearance of their spectral lines. In the early 1900s, an astronomer named Annie Jump Cannon took photographic spectra of hundreds of thousands of stars and began to classify them based on their spectral lines. Originally, she started out using the letters of the alphabet to designate different classes of stars (A, B, C…). However, some classes were eventually merged with others, and not all letters were used. The original classification scheme used the strength of the lines of hydrogen to order the spectral types. That is, spectral type A had the strongest lines, B slightly weaker than A, C slightly weaker than B, and so on. For more information on her life and work, visit the homepage for Annie Jump Cannon  at Wellesley College. Recall from Lesson 3 that the electrons in a gas are the cause of absorption lines—all the photons with the correct amount of energy to cause an electron to jump from one energy level to a higher energy level get absorbed as they pass through the gas. The absorption lines from hydrogen observed in the visible part of the spectrum are called the Balmer series, and they arise when the electron in a hydrogen atom jumps from level 2 to level 3, level 2 to level 4, level 2 to level 5, and so on. The strength of the Balmer lines (that is, how much absorption they cause) depends on the temperature of the cloud. If the cloud is too hot, the electrons in hydrogen have absorbed so much energy that they can break free from the atom. This is called “ionization,” and ionized hydrogen cannot create absorption lines because it no longer has an electron left to absorb any photons. So, very hot stars will have weak Balmer series hydrogen lines because most of their hydrogen has been ionized. Recall also that it takes energy to raise an electron from a lower level to a higher level. So, if the cloud of gas is too cool, the electrons will all be in the lowest energy level (the ground state, level 1). Since the Balmer series lines require electrons to already be in level 2, if there are no hydrogen electrons in level 2 in the gas, there will not be any Balmer series hydrogen lines created by that gas. So, very cool stars will have weak Balmer series hydrogen lines, too. Thus, the stars with the strongest hydrogen lines must be in the middle of the temperature sequence, since their atmospheres are hot enough that hydrogen will have its electrons in level 2, but not so hot that hydrogen becomes ionized. For decades, astronomy students have been taught a mnemonic to remember this order: O Be A Fine Girl (or Guy), Kiss Me! Astronomers divide each class into 10 subclasses—so for example, a G star can be a G0, G1, G2... G9. Our Sun is a G2 star. One summary comment about this discussion is that stars can be roughly classified by their colors, since the spectral types are arranged by temperature. Also, the apparent color of a star gives you a measurement of its temperature, but more accurate classification usually requires a high quality spectrum. Of course, stars are so far away that the separation between our eyes does not make any difference in their appearance. However, we can use Earth’s orbit as a baseline to create separate images of nearby stars. In January, the Earth is on one side of the Sun (consider this the “left eye” position), and 6 months later, in July, the Earth is on the other side of the Sun (the “right eye” position). The distance between the Earth’s position in January and its position in July is twice the Earth/Sun distance, or 2 AU. When you observe a nearby star in January, and then again in July, its position with respect to much more distant, background stars will have changed by a measurable amount, as illustrated in this animation . On this plate, you can see rows of dark grey dots -- those are stars. In order to save plates (which were a pretty precious commodity), a single star would be observed, then the plate would be shifted, exposed again, shifted, exposed again, shifted, etc., sometimes putting 5 or 6 exposures of the sky on one plate. Then, to get additional use out of the plate, it would be turned 180 degrees and exposed 5 - 6 more times in the reverse orientation. The red marks show the location of stars of interest on the plate exposed in one orientation, and the blue marks mark the location of the same stars in the reverse orientation. This plate would then be measured with a machine able to centroid a star's location to an accuracy of a fraction of a micron. Measuring these plates was one of my summer jobs as an astronomy student, and if you visit in person , they do exhibit some of the measuring machines used for this work. The flux (or apparent brightness) of a light source is given in units similar to those listed on the previous page (Joules per second per square meter). In this set of units, or in any equivalent set of units, the more light we receive from the object, the larger the measured flux. However, astronomers still use a system of measuring stellar brightness called the magnitude system that was introduced by the ancient Greek scientist Hipparchus. In the magnitude system, Hipparchus grouped the brightest stars and called them first magnitude, slightly fainter stars were second magnitude, and the faintest stars the eye could see were listed as sixth magnitude. If you notice, the magnitude system is therefore backwards–the brighter a star is, the smaller its magnitude. Our eyes can detect about a factor of 100 difference in brightness among stars, so a 1st magnitude star is about 100 times brighter than a 6th magnitude star. We have preserved this relationship in the modern magnitude scale, so for every 5 magnitudes of difference in the brightness of two objects, the objects differ by a factor of 100 in apparent brightness (flux). If object A is 10 magnitudes fainter than object B, it is (100 x 100) or 10,000 times fainter. If object A is 15 magnitudes fainter than object B, it is (100 x 100 x 100) or 1,000,000 times fainter. If a star is precisely 10 pc away from us, its apparent magnitude will be the same as its absolute magnitude. If the star is closer to us than 10 pc, it will appear brighter than if it were at 10 pc, so its apparent magnitude will be smaller than its absolute magnitude. If the star is more distant than 10 pc, it will appear fainter than if it were at 10 pc, so its apparent magnitude will be larger than its absolute magnitude. 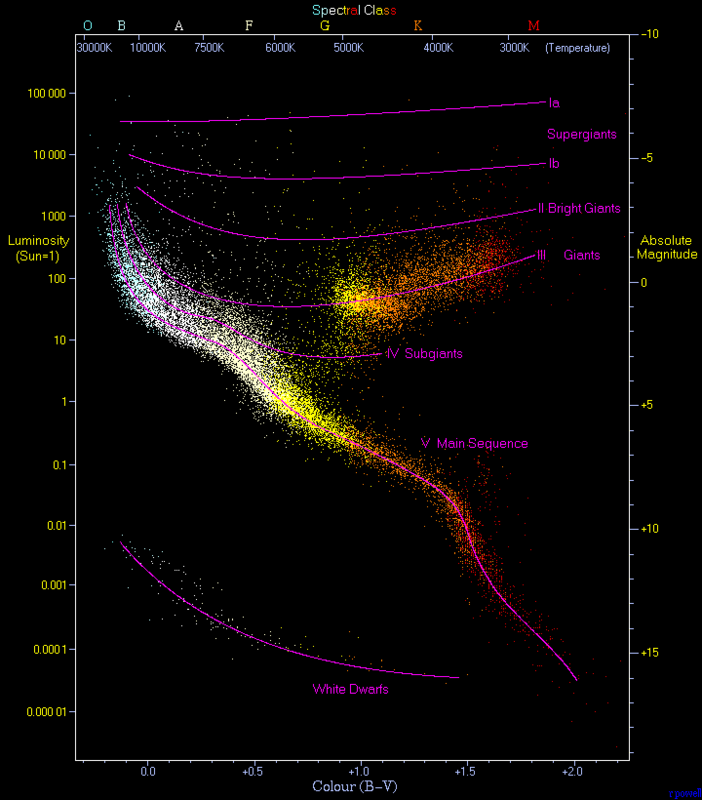 The apparent magnitude of a star has an equivalent flux, or apparent brightness. The absolute magnitude of a star is equivalent to its luminosity, since it gives you a measurement of the brightness at a specified distance, which you can then convert into the amount of energy being emitted at the surface of the star. Because the magnitude system is backwards (brighter object = smaller magnitude), it can be confusing. For this reason, we will not use magnitudes in this course, and I would even recommend not using it in your own courses. Instead, I will continue to refer to the apparent brightness or flux of an object to mean the measurement we make of its brightness on Earth, and the luminosity of an object to refer to the intrinsic amount of energy it emits. However, you should be aware of the existence of the magnitude system because you are likely to see it used in most astronomy publications you read during this course. In the section on parallax, I discussed how the apparent back and forth motion of nearby stars allows us to determine their distances. Besides this apparent motion, can we detect the motion of stars through space? The answer is yes, and we can measure their velocities with different techniques. For any velocity, you can always break it up into components along two perpendicular axes. In astronomical terminology, we do the following: The total velocity of a star includes some motion along our line of sight,—that is, either towards or away from us (called the radial velocity)—and some motion across the sky, perpendicular to the radial velocity. This second component is called the proper motion, and it is actually the more difficult measurement to make. T here is an animated GIF of the proper motion of Barnard's star at Wikipedia . Barnard's star is known as a high proper motion star because you can see its motion compared to background stars in only a few years. Most stars have much smaller proper motions that are much more difficult to observe. Starry Night also has a few resources for investigating proper motions. In the "Favorites" menu of Starry Night Enthusiast, if you choose the Barnard's star option under Stars, or the Change Over Time option under Constellations, you will see additional examples of the proper motion of stars over much longer time periods. If you take several images of a star field over time, most of the stars visible in the frame will be in the same place in each frame down to the limit of your ability to measure their location. However, some nearby stars can move noticeably, similar to Barnard's star in the movie at the link above. Barnard’s star moves by a distance equal to the diameter of the Moon (about half a degree) in 180 years. For most stars, which are more distant from us than Barnard’s star, the proper motion is much smaller. A typical value of the proper motion for a star is only a few thousandths of an arcsecond each year. Thus, it can take a 50-year time difference between photographs for a typical star to move by an easily measurable amount so that its proper motion can be determined with reasonable precision. On the other hand, the radial velocity (motion towards or away from us) can be measured from one observation of a star’s spectrum! This is because the absorption lines in the spectrum of a star shift because of the Doppler Effect. Figure 4.7: The Doppler Effect—Waves emitted by a source moving from the right to the left. The frequency is higher on the left (ahead of the source) than on the right. The waves of light in the figure are represented as rings, similar to the waves in a pond. If the source of a wave is stationary, the space between each ring (the wavelength) should be constant, and the rings should appear completely circular. An observer located anywhere around the source will record the wave arriving at her location with a wavelength equal to the wavelength as it was emitted. Because optical light with a short wavelength is blue, and long wavelength light is red, when the wavelength of light gets shortened by the Doppler effect, we refer to the change in the wavelength as a Blueshift. When the wavelength of light gets lengthened by the Doppler shift, we refer to the change as a Redshift. It doesn't matter if the source is moving or the observer is moving. That is, if the source of the waves is stationary, but you are approaching it, you will see a blueshift. The change in the wavelength is proportional to the apparent velocity of the source. That is, the faster the source is moving, the more of a shift you will see. Fig. 4.8: The spectrum from a stationary source on the left, and on the right, the spectrum from the same source with its absorption lines redshifted because of the Doppler Effect. Δλ / λ 0 = v r / c This equation is not rendering properly due to an incompatible browser. See Technical Requirements in the Orientation for a list of compatible browsers. In this equation, Δλ This equation is not rendering properly due to an incompatible browser. See Technical Requirements in the Orientation for a list of compatible browsers. is the difference between the measured wavelength of the line in the star’s spectrum and its wavelength in the lab. The rest wavelength is λ 0 This equation is not rendering properly due to an incompatible browser. See Technical Requirements in the Orientation for a list of compatible browsers. , which is the wavelength of the spectral line as measured in the lab. The radial velocity of the star is v r This equation is not rendering properly due to an incompatible browser. See Technical Requirements in the Orientation for a list of compatible browsers. , and c This equation is not rendering properly due to an incompatible browser. See Technical Requirements in the Orientation for a list of compatible browsers. is the speed of light. Δλ / λ 0 = ( 657.0 – 656.3 ) / 656.3 = 0.001 This equation is not rendering properly due to an incompatible browser. See Technical Requirements in the Orientation for a list of compatible browsers. v r / c = 0.001 This equation is not rendering properly due to an incompatible browser. See Technical Requirements in the Orientation for a list of compatible browsers. v r = c x 0.001 = 3.0 x 10 5 km /sec x 0.001 = 300 km /sec This equation is not rendering properly due to an incompatible browser. See Technical Requirements in the Orientation for a list of compatible browsers. Since the sign of the velocity is positive, this means that the object is moving at 300 km/sec away from the observer. use the Doppler shift formula above to calculate its velocity. Note that this requires you to know the rest wavelength of the line as measured in the laboratory, which means you need to be able to identify the line in the spectrum of the object even if it has been shifted far from its rest wavelength. This is one of the difficult tasks of observational astronomy. From the "Practical Uses of Math and Science" is a description of an in-class activity on trigonometric parallax . Here is a lesson plan from the New Horizons mission on parallax and the discovery of the planet Pluto . Jim Kaler's website on STARS and the Star of the Week  are an excellent source of information on all aspects of stars, including topics like color, spectral types, the HR diagram, and others. At the Sloan Digital Sky Survey SkyServer website, they have a basic  and advanced lab exercise on measuring the colors of stars . They also have a basic lab exercise  and an advanced lab exercise on classifying stars into spectral types .